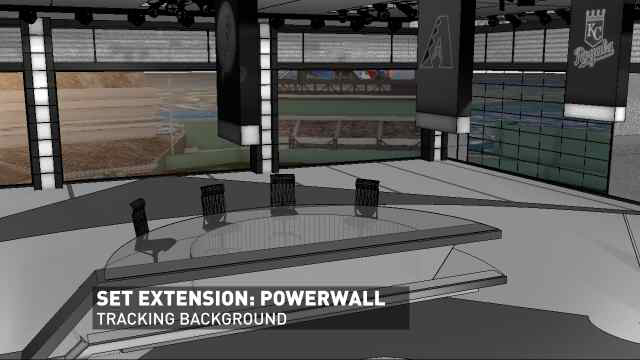 During the MLB Now relaunch, we were given the opportunity to design and create Virtual and Augmented Reality elements for MLB Network's new Studio 21. The opportunity to blue-sky was fantastic and we developed ideas without regard for technology restrictions - think big first and working with our partners Motion Path and Avid to solve the technology. The goal was to create a naturalistic presence within the MLB broadcast and create illusions that truly felt "real" to the viewer. This approach suits both the spirit of baseball as well as MLB Network's approach to studio shows - keeping it real. Understanding the narratives and features of the show in question MLB Now helped us brainstorm, develop ideas that worked for the show & produce mock-ups to illustrate our thinking. Here is one of the mock-ups done with 3DSmax. Mockups were extremely important to show the client how an element would be staged and an approximation of overall look. But also important not to over-produce as the end product was running off the Orad real time system and the look and rendering is different. The BIG IDEA: making VR + AR + physical space interact - creating an illusion that no one would notice.